Kim Roth, Strength United executive director (at far right); Francesca Vega, CSUN director of Government and Community Relations (at far left), and Joni Novosel of Dignity Northridge Hospital gather with the Valley Reps outside the Family Justice Center in Van Nuys in September 2018. Photo by Lee Choo. 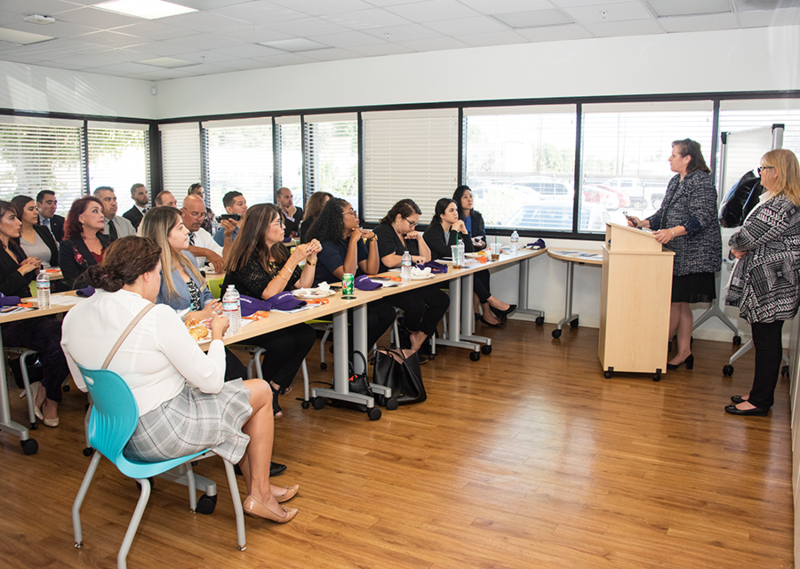 Kim Roth, Strength United executive director, speaks about the organization at a Legislative Brunch for the Valley Reps at the Family Justice Center in Van Nuys, in September 2018. Photo by Lee Choo. 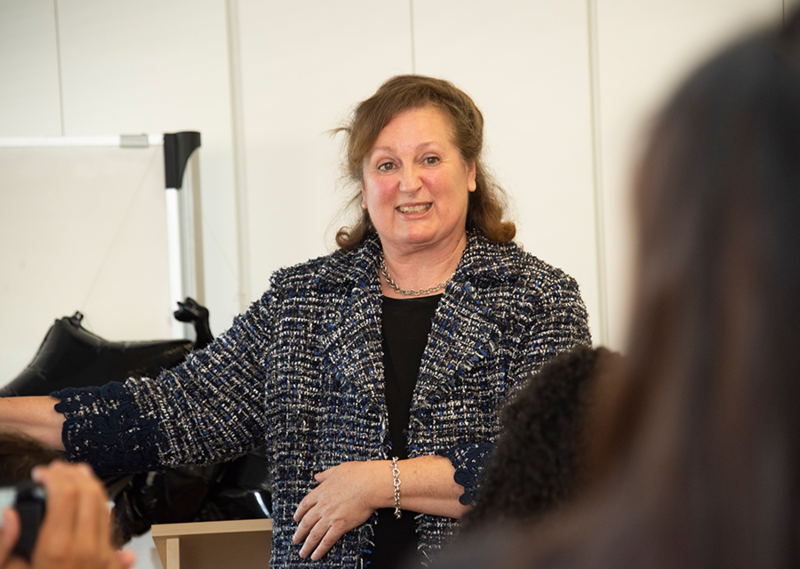 Kim Roth, executive director of Strength United, presents at the Legislative Brunch for Valley Reps at the Family Justice Center, in September 2018. Photo by Lee Choo. 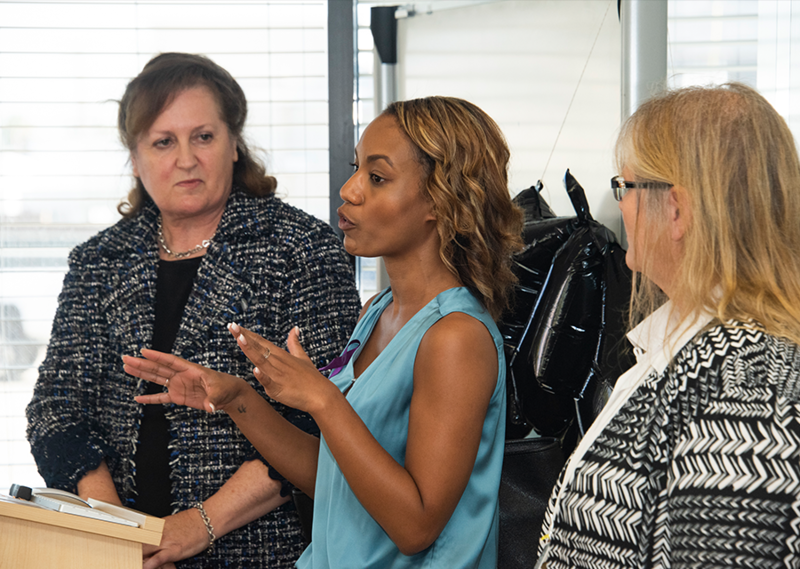 Chanel Smith (center), from the City of Los Angeles Mayor's Office of Public Safety, speaks at the Legislative Brunch at Strength United's Family Justice Center, in September 2018. Photo by Lee Choo. 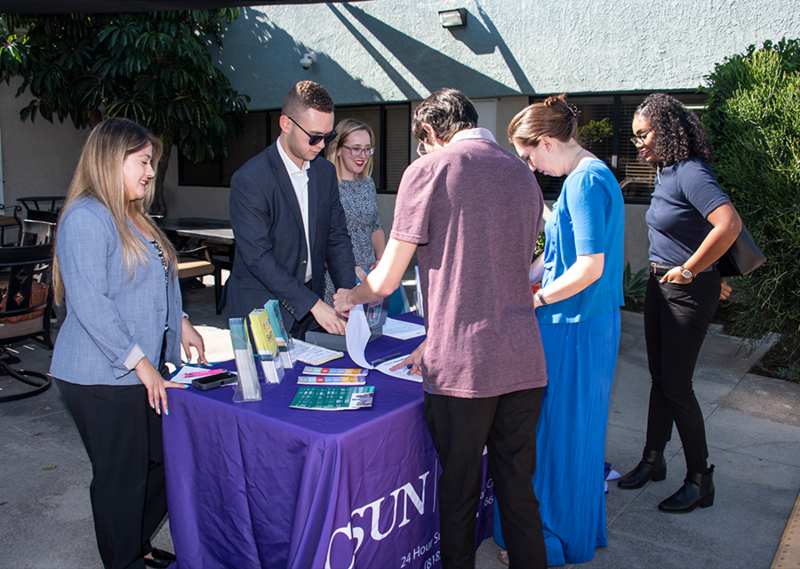 Valley Reps pick up more information about Strength United and the Family Justice Center at a Legislative Brunch, in September 2018. Photo by Lee Choo. 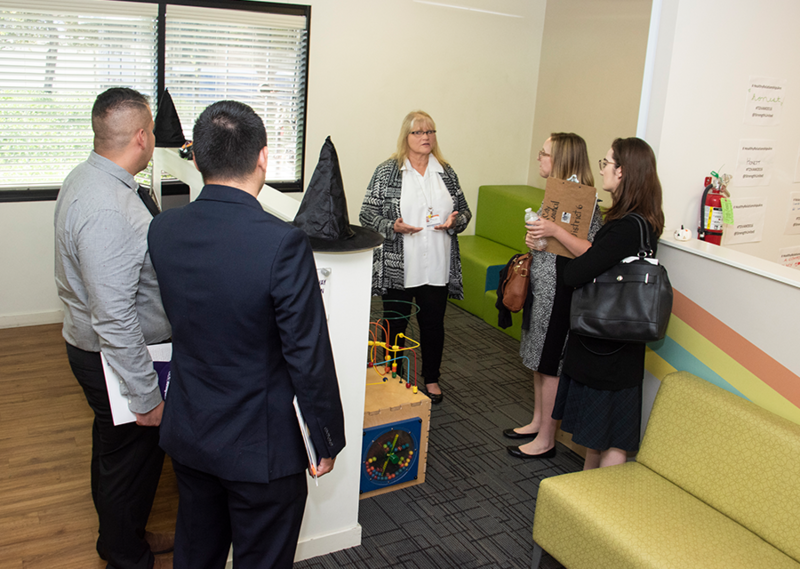 After the presentation, Joni Novosel of Dignity Northridge Hospital leads a tour for Valley Reps around Strength United's Family Justice Center in Van Nuys. Photo by Lee Choo. As awareness about crimes of sexual assault and domestic violence continue to grow in the #MeToo and #TimesUp movements, national and local advocates for survivors and assault prevention are seeking to continue to build successful tools and resources to meet the growing needs of women, children, men, families and the LGBTQ+ community. For decades, Strength United staff, faculty and student volunteers have devoted themselves to fortifying the community and making the San Fernando and Santa Clarita Valleys safer for families and individuals. Operating through California State University, Northridge, Strength United is a nonprofit organization committed to aiding victims of domestic violence, sexual assault and child abuse. 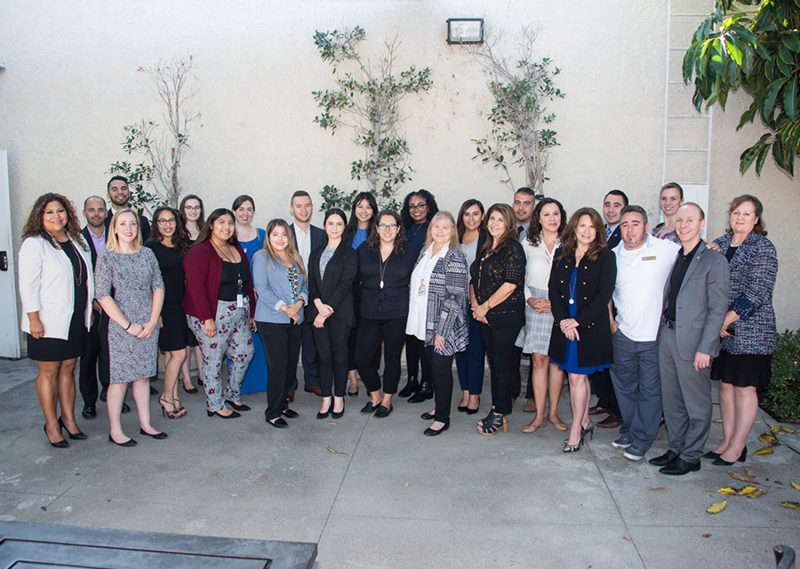 This fall, Strength United hosted a Legislative Brunch for the Valley Reps, a group of legislative representatives from the offices of elected officials who represent the San Fernando Valley at the local, state and federal levels. These representatives hold regular meetings to learn more about community resources and services, like those provided by Strength United. The program was held at Strength United’s Family Justice Center in Van Nuys, which was the first of its kind in Los Angeles County when it opened in 2015. Launched by Dignity Health Northridge Hospital’s Center for Assault Treatment Services (CATS), the center functions as a one-stop haven for victims of violence, providing them with myriad services they would otherwise have difficulty accessing. CATS relies on Strength United to help victims through the next steps after being rescued from a violent or abusive situation, said Joni Novosel, Dignity Health Northridge Hospital director, at the legislative brunch in late September. “When we turn them over to our partner Strength United, they take them from victim to survivor,” Novosel said. She also shared updates about the progress taking place in efforts to aid local survivors. One such change involves removing the need for those who need services to specify themselves as male or female. “This is the first year we’ve been able to track people who do not identify as male or female,” Novosel said. On forms, visitors to service centers such as the Family Justice Center may now indicate “other” as their gender, so as to not be “put in a box,” she said. Novosel also emphasized the shift from intervention to prevention taking place through CATS and other Strength United partners. Prevention programs in the works include Safe Dates, which targets dating abuse among adolescents; Escape Now (in collaboration with New Horizons), which aims to assist those with cognitive and developmental disabilities — a group who are 70 percent more likely to be a victim of abuse; Beyond Trauma, a peer support group; and domestic violence prevention workshops at Los Angeles Unified School District parent centers. A partnership with the Valley Care Community Consortium is also helping to create a domestic violence committee dedicated to preventing violence between nontraditional partners. One in three adolescents in the United States is a victim of physical, sexual, emotional or verbal abuse, Novosel told the civic leaders. Additionally, “violence begets violence,” as 70 percent of people in U.S. prisons were brought up in homes affected by domestic violence, she said. Kim Roth, executive director of Strength United, said she believes the CSUN organization and the Family Justice Center can further extend their capacity to intervene in and prevent crises. To achieve that, “we need more space, and we need more partners,” she said. Roth also emphasized the need for increased access to more data and more input from local government agencies, to help the Family Justice Center track its successes and proceed with evidence-based practices. Strength United’s origins in and partnership with CSUN’s Michael D. Eisner College of Education is one of the most important things about the organization, Roth said. “CSUN is very committed to making a change in our community in meaningful ways,” she said. “We’re very proud of that relationship.” Strength United serves as CSUN’s largest childhood center and is currently training 118 volunteers. An initiative to apply the model of the Family Justice Center throughout the city of Los Angeles is currently in the works, Roth said. With this development, as well as plans to obtain more space and expand the building itself to serve more people, the organization hopes to inch closer to bringing an end to domestic violence and sexual assault in Los Angeles County — and beyond. Strength United aims to ensure that aid and services are available for anyone in need, at any time of day or night. Their 24-hour support and resource telephone lines may be reached at (818) 886-0453 or (661) 253-0258. These hotlines are open to provide information, crisis intervention and emotional support seven days a week, year-round. For more information, visit www.strengthunited.org or visit the Family Justice Center at 14651 Oxnard Blvd., Van Nuys.